Nasr al-Din al-Tusi's Proof of the Pythagorean Theorem. Nasr al-Din al-Tusi (d. 1274 AD) was a renowned Khorasani Muslim Mathematician who reexamined Euclidean geometry [Khorasan is today's Iran/Afghanistan]. In this plate, one can read, in Arabic, Nasr al-Din al-Tusi's version of Euclid's proof of the Pythagorean Theorem. (see the discussion on p. 16 of  for a generalization and an analogy). It is claimed that the oldest proof goes back to the Chinese from about 3000 years ago (circa 1800 BC; what you will find in this hyperlinked slide is their version; it is the easiest proof). The oldest records of 'Pythagorean' numbers are found in clay tables dating back to the 1600-1800's BC found in Babylon, Iraq; see . There are many proofs of this joyful fact online like here and here. 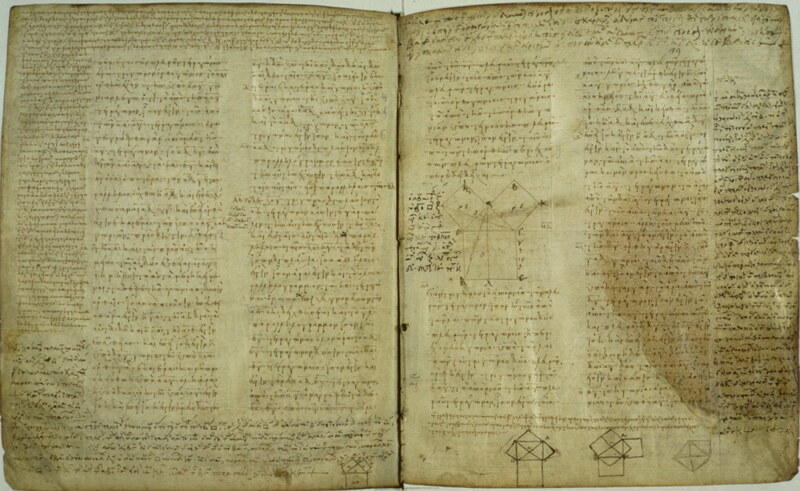 In this document from about 900 years ago, we explain some of the features of "Arab" mathematics and offer a translation as well. Al-Tusi was not Arab. However, Arabic was the lingua franca of science in his time. This proof is already available in English online. It is said that Pythagoras (whose father was `Lebanese' and mother was `Greek', but spent most of his life and died as a `Sicilian' in Syracuse) learned his mathematics from the Babylonians. The statement of his theorem was found in their ancient texts. The structure of the Mathematical language as we use it today can be traced in this plate. The proof of a given statement is decomposed into a series of "maza`im" (claims) as indicated on both sides of the main text and argumentation based on known or previously established premises (see translation). One can see in the margin above the use of "rules" (Al-Hattani's "Qaidah") and definitions ("Musamma") and the ever-present quod erat demonstrandum Q.E.D. ("wa thalika ma aradnah") announcing the end of the proof. [We construct BG, RA, KC [and TA as to make ABGR and CATK into squares]. CAR is a single line since BAR and BAC are right angles [qaimayn]. This is also the case [of the line] BAT. From point A, we drop the line AL, parallel to BD. The angle DBA is obtus. Thus [the angle] BAL is smaller than [the angle] BAC. The line [AL] cuts the segment BC at the point M. The square [sat.h] BH is cut into the rectangles BL and LC. We draw the segments GC and AD. In CBG and DBA, we have two equal [mutasawi] triangles [having two equal sides and equal angles at B]. Now the triangle GCB is half the square RB since they have the same base GB of the parallels GB and RC [`ala qaidat GB min mutawaziyay GB, RC; this seems to be an established fact--see lemma below]. This is also the case of the triangle BAD. It is equal to half the rectangle BL since they have the same base (Qaidah) BD of the parallels BD and AL [this is also a consequence of the lemma below assumed to be a known previous result by al-Tusi]. Thus the square BR is equal to the rectangle BL since their halves are equal. The same argument proves that the square TC is equal to the rectangle CL. Now the square [with base] BC is equal to the [sum] of the squares [with bases] BA and AC, and this is what we wanted to show. QED. Musamma [Definition]. Consider the trapezoid ABCD. Under such a construction, the segment BD is said to be "of the same base AB of the parallels AD, BC." = 1/2 Area Rectangle (ABCE). See for example the beautiful exposition in the book "Patterns of Plausible Reasoning", Volume I: Induction and Analogy in Mathematics, by G. Pólya, Reprint of the 1954 original. Princeton University Press, Princeton, NJ, 1990, pp. 15-17. In The Random Walks of George Pólya (published by Mathematical Association of America, Washington, DC, 2000), Gerald L. Alexanderson recounts many wonderful anecdotes about Pólya. Being very proud of his library, it is mentioned that he once showed two translations of "Patterns of Plausible Reasoning", one in Arabic and the other in Hebrew. Said Prof. Pólya, "This is, how you make peace." Pólya was of Hungarian Jewish background whose family converted to Catholicism at the turn of the previous century ("Random Walks" alludes to a question of acceptance in Europe for Jews once they converted to Christianity--in `those days', the world was divided into believers and infidels). Pólya had a beautiful mind and a kind demeanor.